A few years back when Will and I were living in Europe, I would bristle at the insinuation that Americans were lazy, or that we always looked for the easy way out. "I'm not lazy! I work full time, I hold down the house while my husband is (constantly) deployed, I take my dog for a 2-mile walk every single day, I'm not afraid to use public transportation," etc etc. I did NOT want to be known as the driving everywhere, potato chip eating on the couch, afraid to venture outside the military base American. My German friends were very impressed by all the traveling Will and I did, even with his multiple deployments, and I made a sincere effort to speak German to the locals. I'm sure they all had a good laugh behind my back, but that's beside the point. Now that I have two small children, I'll own it-I am the lazy American. I can't deny it any longer. I'm pretty sure I would cry tears of outrage if my beloved dry-thru dry cleaners ceased to exist. I had never even HEARD of a drive-thru dry cleaner until I moved to Shreveport, but now that I have it I can't live without it. Do you have any idea how awful it is to try and manage a car seat with a heavy baby and a comforter? It's so much more convenient to have the friendly worker (with a slow Southern accent, no less! ), come out to your car, ask how they can help you, then load or unload everything from your car? It's heaven, I tell you. I am a drive-thru EVERYTHING convert. Today's drive-thru indulgence had nothing to do with alcohol-surprise!-but everything to do with sugary, carby goodness. Specifically, cupcakes. Yes, we have a drive-thru cupcake store here in Shreveport, and since Alessandra was reaching a new decibel level I decided a cupcake was in order. I made up all sorts of noble excuses ("Mark needs a cupcake! He took Tony to the park this morning in the blazing heat. Oh, and Tony has really been good lately, and he misses his papa so much. He needs a cup....oh who am I kidding. I'm at the end of my rope with screaming children today and I'm temporarily throwing my diet out the window"). Say what you like, but you can't tell me this cupcake wasn't deserved. I pulled up to the window, and the smiling, polite girl at the window had to ask me THREE TIMES for my order, because she couldn't hear me over Alessandra's screaming. So. Both of my babies are napping, all is relatively quiet, and there's a mocha cupcake calling my name. 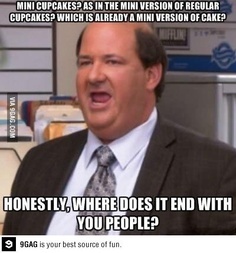 But first, I have to leave you with this meme from The Office, after I saw an advertisement for Cupcake Gallery's new mini cupcakes. You're welcome. Every time I take a rode trip as a lone parent, I wish for drive through bathrooms. I have no idea how that would work, but if they have drive through bars, surely there's a way. Oh, and a drive through post office--not just a mailbox, but where you can buy stamps, mail a package, get a money order, etc.